With the Champions League Qualifiers set to start tonight, I thought I would give a quick update on how I think the games will go this evening, for my first blog on this website. Arsenal go into this game as heavy favourites at the bookies, but I feel it will be a much tighter affair than the odds suggest. Both teams have had a poor transfer window and have resigned to losing arguably their best players in Francesc Fabregas and Alexis Sanchez - both strengthening an already formidable Barcelona side - and neither team seem to have brought in top-quality replacements for the departed. Both teams will have to put their losses behind them as they attempt to make the group stages. Arsenal have an ever growing list of absentees who will miss the match this evening. The aforementioned Cesc Fabregas completed his dream move to Barcelona yesterday, and the future of Samir Nasri is still uncertain, although he is suspended alongside new captain Robin Van Persie. On their injury list they have Jack Wilshere and Tomas Rosicky so their attacking threat is weakened. Udinese are without a few integral players in Sanchez, Inler and Zapata - who all left during the summer - but they have still kept two of their best assets in my opinion. Goalkeeper Samir Handanovic, who recently signed a new five year contract, and their experienced captain Antonio Di Natale - who scored a sensational 30 goals in 41 appearances for Zebrette last season are the players to watch out for. Both teams like to attack and have some defensive frailties that need sorted out so I'm expecting a high-tempo game with a few goals. With Arsenal having a home advantage in the first leg, I expect them to win, but only just. 2-1 to Arsenal. I can't say that the Belarusian Premier League or the Austrian Bundesliga are my strong points, but I do know that both these teams are current champions of their respective leagues - making this game an exciting affair. Both teams have beaten other opposition to make it this far. BATE have beaten Linfield from Northern Ireland, and Lithuanian outfit Ekranas, meanwhile Strum Graz have progressed past Hungarian side Fehervar and Georgian team Zestafoni. Bookmakers have made Borisov favourites for this game, and with them having home advantage, I can see them winning this one. It should be a tight game though. 1-0 BATE. Danish side Copenhagen will entertain surprise Gambrinus Liga winners Viktoria Plzen this evening, although Copenhagen also won the top tier in Denmark last season. The home side reached the quarter-finals in last years competition, being knocked out by English Premiership side Chelsea, and have so far beaten Shamrock Rovers to progress into this qualifier. Plzen have had to play two different sides to help them into this round of the competition and easily dismissed Armenian side Pyunik. They then went on to face Rosenborg of Norway and pulled off a shocker, winning in both the home and away ties. Copenhagen have not lost in their last five games and will be confident of making this six in a row, but Plzen have already pulled off a shock result and done very well in their league, so I'm going to sit on the fence for this game and go for a 1-1 draw. This should be a fantastic game. Both sides have lost key players in the off-season, Twente losing Theo Janssen and looking like losing Byran Luiz, and Benfica have lost impressive youngster, Fabio Coentrao. However, Benfica have splashed the cash during the transfer window and used the money that they received from Coentrao, Di Maria, David Luiz and Ramires, and heavily invested in their squad. They have brought in Axel Witsel, Enzo Perez, Ezequiel Garay, Nolito, Bruno Cesar, Emerson, Nuno Coelho, Nemanja Matic, Eduardo and Joan Capdevilla - who will all play a key role in the Benfica side this season. Twente won their last game 2-0 against AZ Alkmaar with Byran Luiz scoring one of the goals, and Benfica drew at the weekend, but with their new players starting to gel and find each other out, I can see Benfica winning. I'm going to go for a 2-0 win for the away side. Lyon have to progress to the group stages. If they don't, it will be seen as a failure and the board and the fans will not be happy at all. They haven't had a great start to Ligue 1 and last season they didn't perform very well and they will be determined to bounce back. Rubin Kazan have a solid defence and a good attack - with players like Obafemi Martins, Haedo Valdez and Kevin Kuranyi all plying their trade in Russia - although they have been a bit up and down in the Russian Premier League this season. I would expect Lyon to win the first leg at home but nothing is guaranteed against the sturdy Russians. I'll go for a 1-0 Lyon win. Ligue 1 giants Olympique de Marseille threw away a two goal lead at half-time to be held frustratingly with Auxerre at Stade de l’Abbe Deschamps on Sunday afternoon. Marseille’s inability to hit the ground running in a new league season continued. Last year, the 2010 champions had fallen to newly-promoted Caen and Valenciennes in their first two encounters before winning only once in five league games. Didier Deschamps’ men continued that trend, and after last week’s 2-2 draw with Sochaux at the Stade Velodrome, all looked to be set when they raced into a 1-0 lead after 2 minutes. A brilliant Mathieu Valbuena cross found Loic Remy, who headed in after less than 120 seconds played to put the visitors in front. Remy, undoubtedly Ligue 1’s most in-form player at the moment, had scored in nine straight fixtures, as well as grabbing France’s goal in their 1-1 draw with Chile last week. OM were dominating, and it wasn’t long before their perseverance up front paid off. Auxerre’s defensive frailities were fatally exposed as another Valbeuna cross found the head of rising star Andre Ayew to double their lead. With Marseille 2-0 up against tricky opponents in Auxerre, many thought the game had already been won. Wrong. Seconds after half-time Auxerre’s Alain Traore sent a wonderful drive from distance which beat the sometimes-erratic Steve Mandanda in goal, and halved the deficit. Seemingly instant impacts from Laurent Fournier’s half-time team talk. The home side had finally found their feet in a difficult match, and whilst they weren’t exactly dominating. It took only one error from the visitors to draw level. A cross from the right found Roy Contout all unmarked at the far post and he sent a header goalwards to which Mandanda simply couldn’t save. All finished 2-2, and what might be seen as a point gained, may feel like a slap in the face coupled with two points lost for the L’OM support. Nevertheless, OM’s unbeaten run in the league stretched to five games. That is, five consecutive games in which the tie has finished 2-2, a Ligue 1 record. A testing start to the season continues next weekend with the visit of Saint Etienne, before OM face holders Lille away the week after. A lot of people like myself wondered, where in the world did Napoli come from? Napoli have surprised many in Italy, including their own supporters, throughout their campaign in Serie A last season and landing them a Champions League spot. The reason why the Azzurri has caught the attention of many people throughout Europe is by it's fast rise to the top of Serie A.
Napoli's journey to prominence in European football can only be described as a dream for the club and it's supporters. The last time S.S.C. Napoli was a recognized name in European football was during the 1980s. During this era of success, Napoli had one of the greatest footballers to ever play the game. That man's name was Diego Maradona. Maradona's time at Napoli is considered to be the most successful period in this club's 85 year history. The Maradona era began on June 30, 1984, when the club broke the world transfer record to acquire the Argentine from FC Barcelona for a staggering €12 million (that would probably be equivalent to €80 million in today's football market). The amount of money that Napoli invested in Maradona would bring the club success as Maradona would become a religious-icon to the supporters of the club (He was bigger than the Pope in that part of the country). 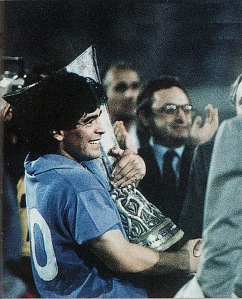 In just a couple of years at the club, Maradona lead Napoli to it's first ever Serie A title as well as winning the Coppa Italia convincingly over Atalanta. Napoli landed themselves in the history books as the first ever club from the southern part of the country to win the Scudetto. Success would continue as Napoli would go on to shock all of Europe, when they beat teams such as Juventus and Bayern Munich, to go land themselves a place in the UEFA Cup final against VfB Stuttgart. They would go on to defeat the German side 5-4 on aggregate to claim their first and only UEFA Cup. Napoli weren't finishing collecting silverware, as they would claim their second Scudetto in 1990. Napoli were on top of Italian football and it seemed as it were to stay that way, but that was not to be the case. The decline of Napoli can be compared to a snowball going down a mountain, as problems would just keep on piling on for the club. Problems started to begin for the club when their star player, Maradona, tested positive for cocaine for a second time in his career. Maradona had to serve a 15 month ban, but worst of all, he did not return to the club. Maradona would go on to sign for Spanish club, Sevilla, ending his unforgettable period at Napoli. Things would just get worse for the club, both on and off the pitch. In this special case, a player was actually bigger than the club. Once Maradona was gone, financial tolls and on-the-field issues would lead the club into a black abyss. Napoli would start losing their best players as they would leave to bigger clubs. Losing players like Gianfranco Zola and many others caused Napoli's squad, to underperform in the league and with financial troubles, the club couldn't replace their star players. This would lead to Napoli to be relegated from Serie A in 1998. Napoli tried to bounce back by getting promoted back to Serie A in 2000, but were sent back down after only one season in the top division. To make matters worse, Napoli would have to file for bankruptcy in 2004. Napoli would finally hit rock bottom. It's also ironic because another big team in England would also have financial problems, leading to relegation and also hitting rock bottom in the same year (If you guys don't know what club that was, it was Leeds United). This next part of the story is like every other story related to this. This is when the certain person or team unexpectedly rises back into prominence with something to prove to the world......Enjoy! After the club went bankrupt, an Italian film producer named Aurelio De Laurentis bought the club and brought back the history of the club in order to keep football in the city of Naples. Because of their short exodus in Italian football, Napoli had to start in Serie C, only to see them get promoted back to Serie B after two seasons. With unmeasurable amounts of support from their fans, Napoli would continue its "rise back to prominence" story by getting themselves back to Serie A in 2006, after getting promoted on the final game of the season. Fast-fowarding five years to the present, Napoli have gone from a newly promoted team in Serie A to a very talented team, with the potential of winning Serie A.
Napoli has once again claimed a seat as one of the top clubs in Italian football. Now, Napoli has their eyes set on dethroning AC Milan and claiming the Scudetto this upcoming campaign. With a new coach in Walter Mazzarri and a talented squad with players like Edinson Cavani, "punk-rocker" Marek Hamsik, Ezequiel Lavezzi, and Gokhan Inler, Napoli have one of the best assembled squads in Europe. With their style of play (In my opinion, the most entertaining team to watch in all of Italy) and a talented squad, Napoli is on a mission to erase their demons from the past and to write a new, successful chapter in their history books. At the beginning of the first half, Chivas looked superior, they created good opportunities but no shots on target. Some minutes later, Monarcas started pressing and Chivas began losing the ball in midfield. As the second half began, Monarcas was coming out of their slumber and was looking better than the visiting team. However, after 5 minutes, an own goal by Yasser Corona puts Chivas ahead. But it didn't take long for Monarcas to get back in the game, two minutes after the own goal, Damian Manso leveled the score. After that, things got complicated for Chivas: Magallón gets a straight red and a few minutes later Araujo follows him, leaving Chivas with 9 men, putting all ideas of attack aside, and being intent on just defending. In the 79th minute, against all odds, Antonio Gallardo scores the winner for Chivas. Toluca's defense didn't have their best performance; too many errors cost them the game. But the local team must be credited for making the most out of the opportunities they had. Pachuca's attack started strong and it took just 2 minutes for Esqueda to put Pachuca ahead. This encouraged the team and Toluca couldn't recover from the shock, they tried to react but didn't find a way and as the minutes went by, they were looking more and more desperate. Gerardo Rodriguez scored the second goal, 12 minutes before half time. Pachuca ruled the game while Toluca tried to follow; Sinha reflected the team's desperation when he was red carded for insulting the ref. Pachuca never stopped attacking and at the 78th minute, Mauro Cejas netted the third goal of the night. The first half was very interesting. All energy from Tijuana, who came out decided to attack. After just 7 minutes Dayro Moreno scored from a free kick, giving Tijuana a partial advantage and the confidence to try and score a second goal. Puebla hadn't given up and after a good play, Riascos leveled the score. Both teams kept attacking but no one could find the net again. Tijuana lost sharpness, the midfield looked disconnected from the final third and soon began to lose intensity, having just a few shots on target on the second half. For Puebla things were not so different, only some good plays that ended nowhere near the goal. Tijuana still haven't won at home this season. The defending champions will kick off their season on the 27th of August against Cagliari, unlike previous seasons, the red side of Milan ended up the happier side last season, after a drought that lasted 7 years. The arrival of Massimiliano Allgeri has brought in fresh ideas and few new faces such as Robinho, Ibrahimovic, Emanuelson and Van Bommel . The Master-tactician was not only successful in bringing in the Scudetto for Milan but also started slowly, but surely rebuilding their aging squad. The former Cagliari coach's priority last season was to win the Serie A which he deservedly accomplished, now comes phase two: Winning the Champions League. Milan’s pre-season has given the fans a bit of mixed feelings about the new season. After demolishing Solbiatese Arno Calcio 12-0 in the first pre-season game, came the disappointing Audi Cup in Germany, Milan managed to finish last, even though they only lost the two games against Bayern Muinch and Internacional on penalties , but the lack of fitness and energy especially in midfield was obvious for everyone to see. The only positive thing that came out of the Audi Cup is the form of Ibrahimovic, scoring two good goals in 90 minutes of play, he looks refreshed and ready to start the new season. After the poor display in Germany came the joy in China, Milan managing to come back from a sublime Sneijder free kick to win the SuperCoppa against their rivals, thanks to goals from Ibrahimovic and Kevin-Prince Boateng. Inter did not give Milan an easy ride as new signing Ricky Alvarez gave the Milan defence a few problems and Milan’s midfield once again, running out of ideas and steam until Ibrahimovic came to the rescue. Milan will finish their pre-season with the TIM Trophy on 18th August and the Trofeo Luigi Berlusconi against Juventus on the 21st of August. Allgeri seems happy with the goalkeeping options, with Abbiati set to be no.1 again after a great showing last season, Amelia and Roma look to provide the back-up if needed. Milan’s defence has been their Achilles heels in the last few seasons, but with arrival of Taiwo, Milan’s left back problem seem to be solved, Thiago Silva and Nesta are the obvious choices for centre backs but with Nesta’s age and injuries, the ex-Roma defender Mexes would provide Nesta cover, Abate seems to have made the right back position his own with great performances last season, the likes of Oddo, Zambrotta, Bonera, Antonini and Yepes will make the occasional appearance and will back up if needed. Kevin-Prince Boateng was immense last term ,after securing him in a long term deal, Milan seem to have found their box-to-box midfielder, the tireless player adds much need steel to the midfield. Milan have a flurry of defensive mids such as Flamini, Ambrosini, and Gattuso, but the experienced Van Bommel seems to be the favourite in Allgeri's line-up. Milan are still looking for Pirlo's replacement ; many names such as Montolivo, Ganso, Pastore, Hamsik, and lately Aqualini, have been put on the table, but a hopeless romantic would hope that "Mr.X", as Galliani calls it, is none other than Kaka. The arrival of "Mr.X" is imminent before the 31 of August. For now, Milan will be fielding in Seedorf and Stephan Elsharaawy captured from Genoa to fill the hole, if things go right, the 18-year old set to become one of Milan’s favorites, with his blistering pace and ability to unlock opposing teams with his trickery and clever passing. The attack has been Milan strong point last season as Robinho, Ibrahimovic and Pato all scored 14 goals in Serie A alone last season. Cassano is still undecided about staying or leaving, while Inzaghi still poses a threat according to Mourinho. Allgeri would hope Ibrahimovic can replicate his Serie A scoring tally in Europe, while Pato still needs that sensational season to prove he’s one of the best young strikers. Milan are favorites’ to pick up the Scudetto, but with a bit of luck, Milan would be able to win the Champions League. Milan have the right mixture of youth and experience this season, and if the veterans can manage to incorporate their grit and fighting determination in the youngsters, we will be able to see the Rossoenri at the Alianz Arena, lifting the most prized club competition again. I was prompted to write this piece becaause a good friend drew my attention to the fact, that the English Premier League, has once again lost a playmaker, especially after the retirement of Paul Scholes and the persistent injuries of Steven Gerrard. The name Cesc Fabregas is as popular to the common man as other hugely popular sportsmen like Roger Federer, Cristiano Ronaldo, Lewis Hamilton, Sachin Tendulkar etc, yet he is only 24 years old. Born May 4, 1987- Cesc, as he was called in the FIFA U-17 tournament in Finland (2003),is one of the best midfielders of his generation and indeed the world. He was extremely brilliant in that U-17 World Cup as his 5 goals from midfield, led him to be named player of the tournament and the competition's joint top scorer, alongside Carlos Hidalgo and Manuel Curto, of Columbia and Portugal respectively. Watching him in that tournament, he struck me as someone who was going to make it big, and I was proved right, when he signed the dotted lines for Arsenal from Barcelona in September 2003, when he was 16 years old. He was't known at that time but Arsene spotted something in him, and was of the opinion that Cesc will be a great player. That was never in doubt when he put in a string of good performances in the League cup (Carling Cup) against the likes of Wolverhampton Wanderers. He became the youngest player to appear and score for the Gooners, all in the space of one month, when he appeared against Rotterham Utd and scored against Wolves. All these achievements and he was still at the tender age of 16. The best was yet to come. Fabregas did not get his opportunity to star in the Arsenal first team until the 04-05 season when starting midfielders Edu, Vieira and Gilberto Silva, had injuries at one period or the other, with him replacing them and put in a string of performances which attracted immeasurable praise from soccer pundits all over Britain and the footballing world. He however, scooped his first trophy as an Arsenal player at the end of the season (his first full season) when they defeated rivals, Manchester United in the F.A Cup final on penalties. The match was the last, that Patrick Vieira played, as captain and player for Arsenal as he signed for Juventus that summer. Wenger was disgruntled as another great player bade farewell to the Highury faithful. But he was very optimistic that Cesc will step up and fill the vaccum left by the talismanic Senegalese- born, French midfielder. The 05-06 season began, with Fabregas taking Vieira's place in the team and his no. 4 shirt a year later. But the captain's armband was passed on to the great Thierry Henry. Fabregas was just the perfect replacement for the departed Frenchman as he put in a series of exceptional displays, alongside G.Silva in both the Premier League and Champions League. The highlight of his season was the quarter-final v Juventus where he came up against his former captain, and in all fairness tore him and the entire Juve team apart in a scintillating display--- he scored the first and assisted his new skipper, Henry, for the 2nd. The Biancconeri coach at that time, Fabio Capello, (now England manager) was full of praise for the Spanish starlet and tipped him to achieve great things. Fabregas alongside Henry, Kolo Toure, Sol Campbell, Jens Lehmann, Robert Pires and others, propelled Arsenal to the final of the Champions League which they led for long periods of the game, despite being down to 10 men as early as the 18th minute of the match, ( Lehmann was sent off for an infringement on Samuel Eto'o) and lost it eventually to his boyhood club, Barca by 2 goals to 1. All in all, Cesc made more than 40 apps that season and was instrumental to just about every good thing that happened to Arsenal, throughout the course of the season. He was still only 19, but already regarded as one of the best young players in the world,even more highly rated at that time, than his friend and national teammate, Andres Lugan Iniesta. Despite the painful UCL final loss, Arsenal started the 06-07 season with so much hope, especially because of Fabregas's rising profile. He became the talisman from then on,racking up goals and assists like no man's business and dictating play without much ado. He was allowed to roam freely ahead because of the defensive assurance of the immense gilberto silva who is by far the best Brazilian footballer to play in the premier league till date. Arsenal failed to reach the heights of the previous season though, but still managed to reach the Champions League Round of 16, but was just edged out by Hiddink's PSV, who were immediately knocked out by Liverpool in the quarter-finals. The club also reached the League Cup final but ultimately lost out to defending EPL champions, Chelsea, in a final that was marred by a lot of controversies. Fabregas nonetheless was nominated for the end of season awards, but lost out to Manchester United's Cristiano Ronaldo in both the PFA Young Player of the Year and Player of the Year. Disappointed as he was, Cesc was still the shining light of the Arsenal team, even with the presence of Thierry Henry and co. This time, Real Madrid took notice of his blossoming career and were heavily linked to him, but Wenger was very adamant to lose him and made it clear to those interested, that Cesc was going nowhere and he meant every word of it. The 07-08 season began very well for Arsenal, despite the transfer of the legendary Thierry Henry to Barcelona-a move which was supposed to have happened before the beginning of the 06-07 season, but Wenger pleaded with Henry to stay put for one more season which he duly obliged. Long time Vice Prseident and majority shareholder, David Dein also left the club for pastures new. Arsene was devastated because he had a very close knit relationship with the departing executive. It was even rumoured that Arsene asked David if he should resign his position as manager, but David refused, saying he was very vital to the future of the club, asking him to remain. Amidst all this, Cesc knew that he was now the focal point of the Arsenal team and he pledged his commitment to the London club. He was still only 21, but he had qualities way beyond his age. Fabregas led the gooners to the summit of the Premier League all the way through to March, but they lost the plot and eventually lost the league crown to a Cristiano Ronaldo- inspired Manchester United. Although many believe that the career threatening injury, Eduardo sustained at St Andrews in February, it was the beginning of the end for Arsenal. Despite this, the Spanish midfielder was nominated for the end of season awards for the second consecutive season. This time he won the Young Player of the Year award while losing the player of the year crown to Ronaldo who deservedly retained it. Fabregas was also named in the PFA Team of the Year for the 2nd straight year. In November 2008, Fabregas was named Arsenal captain, after Wenger stripped William Gallas of the armband following some indiscretion from the French ace and he duly accepted, displaying his leadership atributes, but was unfortunate to be sidelined with injury for a long time. He came back in time for the semi final of the Champions League which they eventually lost to rivals, Manchester United, 4-1 on aggregate. The 09-10 season began with Fabregas in explosive form, hoping to make up for the lost time of the previous season and making his presence felt in a lot of matches that season. He was very instrumental to Arsenal's run yet again to the Champions League quarter- finals where they lost out to Guardiola's Barcelona 6-2 on agg. He however, suffered a leg break in that match and was sidelined for the rest of the season. He came back just in time for the World Cup in which Spain were pre-tournament favourites and lived up to the billing by winning a hard fought final, defeating the Oranje by an extra time goal. The goal was scored by Iniesta, with a sumptuous assist by the one and only Cesc. The summer of 2010 was filled with the Fabregas to Barca rumours. This suggestion became rife as a result of what his Spanish colleagues did to him during the World cup celebrations. Liverpool's Pepe Reina who also doubles as Spain's 2nd choice goalkeeper, and Gerard Pique were among those who tried to force a Barca jersey on the young superstar. Barcelona indeed were interested, as Pep was Fabregas's idol since childhood and the player himself, has many a time, declared his desire to move back to his boyhood club. The Catalan club bid in the region of 35 million pounds, but Arsenal rejected the bid, and Fabregas had to stay with Arsenal, against his wish. The wranglings of the summer did not stop him from giving his best for Arsenal when he needed to- He still turned in his ever impressive showings during the 10-11 season and was very vital to the team's challenge for all four trophies. By February, they were still in contention for all four titles but buckled under the pressure later on, as they were dumped out of the UCL by Barca for the second successive year, surprisngly lost to Birmingham in the League Cup final, thrown out of the F.A Cup by Man Utd, and bowed out in the title race, later placing fourth behind Utd, Chelsea and Man City. It was another sad tale of 'almost there'. Barcelona reiterated their interest in signing the Arsenal skipper in the summer of 2011. This time, Fabregas was in no mood to be refused his dream move back to the club, where it all began for him. He even went as far as offering to pay some part of the money, which will enable him to secure his transfer from the London giants. Barcelona as usual,came up with a laughable offer of 26 million pounds which Arsenal immediately rejected, telling them that it is 40 million pounds or no deal. Sandro Rosell, the President of the Spanish Club came with another deal of 31 million pounds, which fell way short of Arsenal's valuation for their captain. As expected, it was immediately rejected by Gazidis and the rest of the Arsenal Board. The Catalans returned with what they called their final bid for Cesc, worth 35 million pounds + add-ons (although this is not certain) and finally Arsenal cracked. The club finally accepted that Fabregas can leave for Barcelona yesterday, Sunday-14th August 2011 and the deal was finalized today, ending one of the long running transfer sagas-possibly the longest and most frustrating in recent times. Fabregas has finally bade farewell to the English Premier League where he spent the better part of eight years providing defence splitting passes, scoring brilliant, eye catching goals and most importantly cementing his status as a true world class player. All in all, he made 303 appearances for Arsenal, scoring 57 goals and made more than 50 assists in all competitions. A legend already at 24 years of age, he bestrode the Premier League like a colossus.